Good Monday all and happy release day for the authors of FAE WORLDS where we have one veil and five worlds all written by some fabulous authors including Lisa Kessler . Linda Thomas Sundstrom , Jillian Stone, C.C Dowling and Marie Andreas . Only one veil keeps the human world separate from the Fae born. Some believe it’s safer this way. That magic and mundane simply shouldn’t mix. But what happens when worlds collide, and the veil is crossed? Or worse, broken? 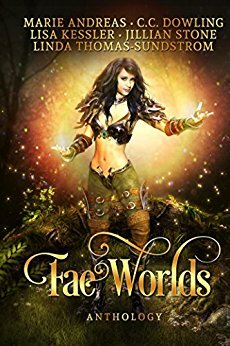 Fae Worlds is a limited edition fantasy romance anthology featuring five unique and NEVER BEFORE PUBLISHED stories ranging from sweet and playful, to downright dark and dangerous. Travel into new worlds of magic and possibility, danger and desire, brought to you by five best-selling and imaginative authors. Come along. Indulge in the magic. The first story was THE ENCHANTED ONE by Linda Thomas Sundstrom . When Teryn gets a letter from her grandmother to come to Ireland . This is a mystery to her because she didn't even know she had this grandmother . So you head over to figure out the mystery . But there is more to the cottage then meets the eyes . She is swept away on an adventure with a gorgeous man of mystery. Who is trying to send her away. What would you do . Staying could make all her dreams come true but going would keep her safe . What would she do . This is a fast paced short story that will have you heart melting . You will enter the world of the dragons and what one woman can really do when she finds out who she is really. I truly like this authors writing she takes us on a journey that will have you blushing every now and there . This story was so much fun to read . I loved the characters and I really liked how the author used the back drop of COMICCON for these two characters to meet. The author uses some great pop culture phrases and we get to learn about pop tarts and fritos . I giggled so much through this novella . I truly enjoyed each and every story in this book. The authors all did such good jobs . Each story is different but still in the same genre . So if you like dragons . fairies . sprites . and more of the fairy world . Check out this collection of stories . Thanks so much for posting a review Patricia!